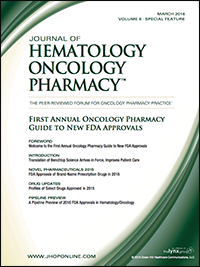 The Journal of Hematology Oncology Pharmacy has published its first annual Oncology Pharmacy Guide to New FDA Approvals with the goal of providing pharmacists and other healthcare stakeholders with a comprehensive review of pharmaceuticals that were newly approved, or that received important new indications, by the US Food and Drug Administration (FDA) in the previous year. The current 2016 edition represents the first year of publication of this Guide by the Journal of Hematology Oncology Pharmacy. 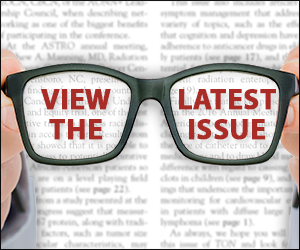 The number of oncology trials seeking new indications for new and known agents is continuing to grow at a fevered pitch. The fruition of this work is now being realized; in the past 12 months, there have been 36 hematology/oncology drug approvals, 18 of which involved new drug entities. Waldenström’s macroglobulinemia (WM), also known as lymphoplasmacytic lymphoma, is an indolent subtype of B-cell non-Hodgkin lymphoma. WM is characterized by malignant B-cells that overproduce the abnormal monoclonal protein known as immunoglobulin (Ig) M or macroglobulin. Melanoma represents the most dangerous form of skin cancer. According to recent data, the 5-year relative survival rate for Americans with distant melanoma is only 17%. The National Cancer Institute estimated that in 2015 there were 73,870 new cases of skin melanoma and more than 9900 patients died from this disease. In the United States, the total estimated national expenditures for the treatment of melanoma reached $2.8 billion in 2015. Lung cancer is the leading cause of cancer-related mortality in the United States among men and women. The most common type of the disease, non–small-cell lung cancer (NSCLC) accounts for approximately 85% of all lung cancer cases. NSCLC comprises several disease histologies, including adenocarcinoma, squamous-cell carcinoma, nonsquamous carcinoma, large-cell anaplastic carcinoma, and adenosquamous carcinoma.